Posted in VORTEX2 News on September 14, 2009 by Susan Cobb. Posted in VORTEX2 News on May 21, 2009 by Susan Cobb. Posted in VORTEX2 News on March 1, 2009 by Susan Cobb. 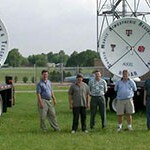 NOAA/NSSL will host a VORTEX2 Media Day on May 8, 2009 from 10 a.m.–12 p.m. Interested media will have the opportunity to tour VORTEX2 research vehicles and interview VORTEX2 researchers and teams. Posted in VORTEX2 News on February 28, 2009 by Susan Cobb. A VORTEX2 planning meeting was held in Boulder, Colo. February 23–24. VORTEX2 Principal Investigators gave short presentations on their planned projects, strategies, and scientific objectives. Posted in VORTEX2 News on June 12, 2008 by Susan Cobb. 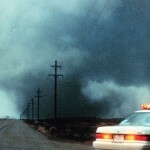 NSSL is gearing up for the largest-ever field program to study how tornadoes form and dissipate. VORTEX-2, set to run from May 10 – June 15 of 2009 and 2010, is a NOAA/National Science Foundation (NSF) funded program bringing collaborators from around the United States.